Singer – Regardless of gear, the most important part of the vocal chain is the singer. With that in mind, accommodate the artist as best as you can by creating a comfortable environment. This could be as simple as dimming the lights, or lighting candles or incense. Herbal tea or lemon water are good for the throat, soft drinks and coffee, not so much. If it all possible, try to prevent performers from bringing “a posse” of friends. There’s always a direct, inverse relationship between the number of people in the room and the productivity of a session, and performers will be more open to constructive criticism if they’re not concerned about impressing their friends. I usually set the instrumental/vocal monitor headphone mix to my own liking before the session starts, this way I know the mix is in the ballpark. Be aware that the vocal level in the headphones can greatly affect performances. Turning the vocals up really loud (and/or heavily compressing them) tends to make singers sing quietly (which might be good for an intimate performance, or mellowing out a screamy singer); conversely, decreasing the vocal monitor level will make the singer work harder and sing louder (good if you’re trying to summon a singer’s inner Soundgarden or Led Zep). Volumes could be written about the fine art of coaxing the best performance from a singer, but for now, we’ll leave it at this: be aware of the delicate balance of pushing a little for better performances vs. pushing too much and ruining confidence and comfort levels. Work with the artist, not against them, and keep it positive! 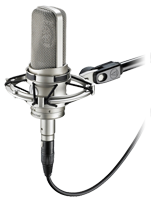 Microphone– Unless you’re going for a specific effect, it’s usually best to use a large-diaphragm condenser mic. A few years back, this meant an over-$1000 investment, but these days quality large-diaphragm condensers can be had for as little as a $100. Like many other audio pieces, investing more money tends to improve quality in smaller increments as the dollars pile up (i.e., a $5000 mic isn’t ten times better than a $500 mic). Mic Pre – Most modern audio interfaces include two or more channels of microphone preamps, and these are usually adequate for most purposes. I’m generally of the opinion that a budget external mic pre won’t offer much (if any) audible quality improvement. Don’t be fooled by the marketing hype of “tube warmth!” in a $50 mic pre. Tubes don’t necessarily equate to greatness; the vast majority of the warm, colored sound typically attributed to tubes is actually the sound of the transformers necessitated by tube circuits, and fantastic-sounding transformers usually aren’t cheap. With that said, there are some great-sounding mic bargains to be had (relatively speaking) from Golden Age, Warm Audio, and Focusrite. Compressor – Perhaps the most misunderstood piece of gear in the vocal chain, at the most basic level (hey, a pun! ), the purpose of a compressor is to make loud things quiet, and quiet things loud. This is important because vocals naturally tend to have a large dynamic range, making them too quiet or too loud in a mix. Additionally, different types of compressors impart specific (and desirable) tonal and dynamic characteristics to vocals and instruments. So called “opto” or “electro-optical” compressors are revered for their ability to dramatically squash the dynamic range with very little audible “pumping” or breathing artifacts. If you have the duckets, by all means, a standalone opto compressor sounds fantastic after the mic pre, but they can get pricey. Like the mic pres discussed above, there are some standout bargains, such as the FMR RNC (“really nice compressor!”), Warm Audio’s WA76, and the Summit TLA-50. While we’re gettin’ all compressor-nutty, upgrading to Mixcraft Pro Studio 7 is more affordable than you think and adds the very fat and warm VTC-1 Vacuum Tube Compressor plug-in, and the uniquely squasherrific (that’s a word, right?) LM-2Z Zener Limiter (along with a ton of super-great mix plug-ins). A bahgain! Hey Mr. Expert Acoustica blog guy, can’t I just record my vocals dry and add one of Mixcraft’s included VST compressors later? You sure can. Better still, you could add a compressor VST plug in the audio channel you’re recording, allowing the performer to hear the compression in their headphone mix (which will likely improve their performance), but Mixcraft won’t actually print the track with the compression applied, so you won’t be stuck with the compressor settings. 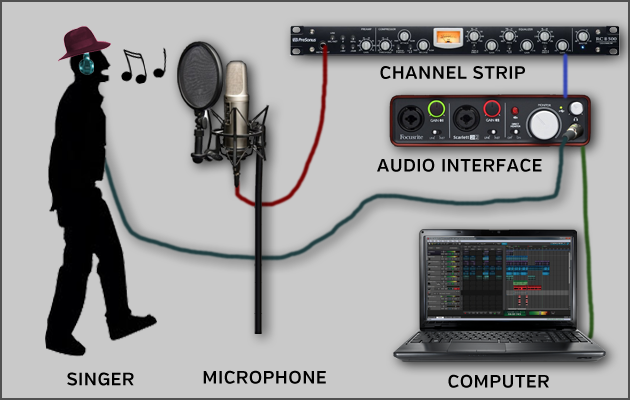 This is a good choice if you’re using a simple chain like the one in the diagram above – i.e., no fancy-pants external mic pre and/or compressor. Mixcraft’s Classic Compressor VST set to the default “Vocal” preset works great in this application – just fine-tune the amount of compression with the threshold knob. Remember that turning the threshold knob to the left equals more compression, and the output knob adds “makeup gain” to compensate for the reduction of overall volume as you increase the compression amount. If you’re using an external compressor, but no external mic pre, some audio interfaces with mic pres feature insert jacks that let you add an external compressor between the audio interface’s mic pres and digital conversion sections. Channel Strips… such a deal! – If you don’t want to shell out the duckets for a separate mic pre and compressor, so-called “channel strips” combine a quality mic pre and compressor in one box, and often include EQs, de-essers, saturation, and more. Furthermore, these units are sometimes stereo, giving two independent “channels” for stereo recording. Though you probably won’t track lead vocals in stereo, you might record backing vocals, pianos, or guitars in stereo. Though you won’t have the variety afforded by hand-picking each component, channel strips are an excellent compromise for high-quality recording on a budget. Just use caution with the “extras,” because once you’ve tracked with additional effects, they’re in the recording forever. I usually only use channel strip EQ to filter out frequencies below about 150Hz. This gets rid of floor rumble and distant garbage trucks without affecting vocal recordings (unless you’re recording Lurch from the Addams Family, humans don’t make sound that low). I leave the fine-tuning EQ’ing for the mix stage using plug-ins. In the diagram above we’ve added an external channel strip into the equation. Our singer has also donned a jaunty purple fedora, because they’re always pulling that kind of crap. Audio Interface – I’m not going to go into too much detail here, because if you’re reading this, you probably already have an external USB audio interface. 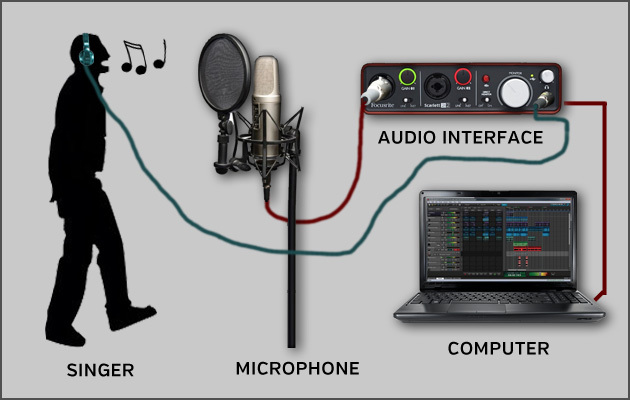 Though it’s certainly possible to record vocals and other sources using your computer’s internal audio or sound card capabilities, you’ll have far better fidelity and ease of use with an external USB audio interface. You’ll likely want a model with built-in microphone preamps, but these days, most audio interfaces provide at least two channels. 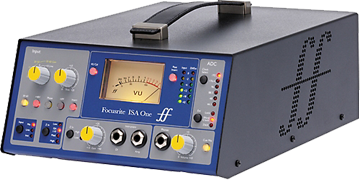 Besides increased fidelity, the most compelling reason to use an external audio interface is its ability to record with lower latency, for less audible delay when monitoring signals during recording. This means the performer won’t hear annoying slapback echoes on their voice in their headphone monitor while tracking. Additionally, an audio interface with lower latency will make virtual instruments more responsive when you’re playing them live (as in playing the keys, not performing at the Astrodome). In our next installment we’ll get down to the nitty-gritty of mixing and recording professional-quality vocal tracks! Great job Mitchell! Getting ready for some equipment in my new studio so this gave me some good ideas to get started with. Thanks for the info and keep the blogs coming! Candles and incense? What? No Lava Lamp? Studios gotta have a Lava Lamp. More nice work Mitchell, appreciate the work in preparing these!